How much do you know about your website? 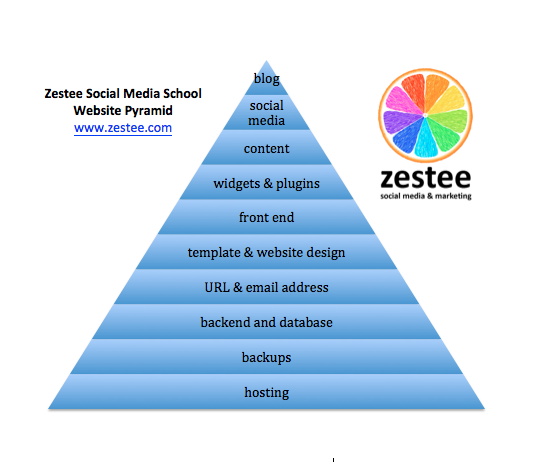 After trying to explain the structure of a website to clients recently, I created the Zestee Social Media School Website Pyramid. I’ve found that visualising and creating models to explain concepts makes it easier to understand. For those who built their own website, all of the 10 sections on the pyramid above will be familiar. If you’ve had a website developer create your website, only the top few are likely to be the ones you work regularly with. Either way, when creating – or paying for – a website, you need to know about all of them. You could also compare your website to a house. Though essentially the basic function of each house/website is the same (a house to keep you warm and dry and a website to convey information), the actual specifications – and price – can vary dramatically. Getting a basic understanding of this pyramid and the 10 sections will put you in a much better position to either build your own website or work with a developer to do so. Like a house, you need to build from the ground up. This is the space where your website lives, on a server. It’s like the block of land your house is built on. Like land, there are a wide variety of options and packages available. This is very important and often forgotten, so should be built into the foundations. This is like insurance for your house, or a security system. Once organised, you often don’t need to worry about this until things go wrong – but if they do you will certainly be glad you planned this early on. Like the areas behind the walls and in the roof of your house, I find this a little scary and hope I never have to go there. Yet it’s essential to the smooth running of your website. WordPress call the package of files your website runs on a “database” and the “backend” is the filing system. How will people find you and contact you? Like a physical street address, you need a URL (unique record locator) such as www.zestee.com so people can visit and an email address so people can send you post. Now the structure is in place, you can make your website pretty. Like interior design, website design is highly personal. There is a massive range of templates out there and a professional website design company such as www.lemonberry.com who also incorporate graphic design can get your site looking lovely! (They can also do all the other parts of a website for you too) Again, like a house, prices can vary. If you stick to a simple template design, you can stick to a budget, however if you need to get more specific about exactly where you would like things to be, this is possible but requires some more time and money. This part of your site is where you will interact with the content, like the front door. One of the reasons I personally work exclusively with WordPress as a website platform is that their Front End is very easy to use. A little like furniture, you can add and mix and match these throughout your website for functionality. This is where you move in. Like people living in a house, your content will add unique personality to your site. You can decide on keywords, categories, tags etc to make your site easier to find with SEO (search engine optimisation). Invite your friends for a house warming party and ongoing social life! Connect your website up to Facebook, Twitter, LinkedIn, Pinterest and any other social network you use. This works both ways – you can tell people in your social networks how to find your site and also make it easy by adding sharing buttons so visitors to your site can easily share. Keep everyone up to date with what’s happening and keep things fresh by blogging regularly. Again, great for SEO and helping people to find your site. I hope this pyramid image and the comparison with a house helps you better understand how to build a solid website. Would love your comments below! Were you already aware of and are you familiar with all these parts of your website? Do you do them yourself or outsource all of it or parts of it? This post is part of the Zestee Social Media School. Learn how to capture the power and potential of social media for your business. Take a look at the Zestee Services page for options to suit every business and budget. Would you like to receive free social media tips monthly? Sign up for our e-newsletter on the right, or connect with us on Facebook, Twitter, Pinterest and Google+.